Which Tells Us More About Love: The Poetry of Shakespeare or the Reward Circuitry of the Brain? 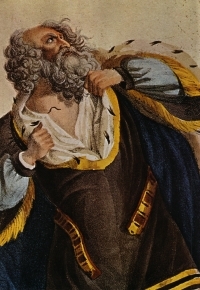 Ludwig Devrient as King Lear, circa 1769. To understand why, consider what happens in the brain when people are given rewards under two different conditions: predicted and unpredicted. The psychiatrist Gregory Berns did just that in a study in which subjects were given fruit juice and water, both naturally pleasurable rewards, while scanning their brains with an M.R.I. A reasonable reader can’t help wondering at this point if neuroscientists actually know what a “reward” is. I say this as a frequent drinker of fruit juice and water myself. I have nothing against fruit juice and water. There are, indeed, times in my life when I would very specifically like a glass of fruit juice or water, and ask for them by name. But no one has actually offered them to me—as a reward—since I was old enough to buy my own juice boxes. This may seem a minor point, but remember that Friedman is making assertions about love based on how people strapped to an MRI scanner reacted to being offered water and juice. The assumption made here as that pleasure is fungible: any experience that might conceivably be pleasurable is functionally equivalent to any other such experience because they are filtered through the same brain circuitry. Water and love are thus already reduced down to emotional equivalents by the premise of the experiment, simply because a part of the brain activates in both situations. A skeptic might point out that nowhere in the entire annals of romantic poetry has anyone ever written “love is like a glass of water.” But neuroscientists are not skeptics: not where the brain is concerned. They are shopkeepers who swear they have anything ever produced somewhere in the back storage room—and actually believe it. During part of each session, subjects received water and fruit juice at random intervals; during another part, the water and juice were administered every 10 seconds. It stuns me that no one involved in the experiment thought that, after just more than a minute, being offered water and juice every 10 seconds would turn from a “reward” to a “source of constant annoyance.” But it would. If you don’t believe me, try it yourself: find someone who can’t leave their post (a security guard, perhaps, or someone manning a cash register), and begin offering them water or juice every 10 seconds. They might be grateful the first time, absolutely. But by the tenth time in 100 seconds? Is it possible that the reason the experiment found a difference between the brain’s reaction to randomly offered rewards and predictable rewards is that the predictable rewards were, in fact, extremely annoying? Professor Berns discovered that the water and juice elicited greater activation in the brain’s reward circuit when the reward was unanticipated than when it was delivered in a predictable fashion. The pattern held true whether the reward was water or fruit juice—even though most subjects claimed a clear preference. This, Friedman says, explains why we fall in love with people who aren’t good for us: the unpredictability of their rewards is irresistible to our brain, whether or not we want to be treated this way. Are we sure that’s what’s happening here? Because I’d like to suggest there’s an alternate explanation. Being in an MRI isn’t fun. Being asked every 10 seconds whether you want juice or water isn’t fun—and absolutely fades into the background of the experience. It becomes one more part of the torture. But when you are asked at random intervals whether you want juice or water, well, independently of the fact that you don’t actually want water or juice, the distraction is nice. That is to say, in an unpleasant situation, any novelty is itself at least moderately pleasurable because it momentarily distracts you from the unpleasantness. So the reason why the pleasure centers of the brain were firing more in response to unpredicted rewards is that the novelty in this frankly dreadful environment was itself pleasurable. The pleasure centers fired more in one group because the rewards weren’t equal: the group that had novelty was getting more pleasure. So it’s not necessarily that unpredicted pleasures are intrinsically more pleasurable. There are certainly times when this is the case, but I think compelling arguments could be made that there are times when it is not true. It is, however, clearly the case that there are situations when novelty of any kind is a pleasure. Now, let’s get back to love. Friedman writes, “It turns out that human love and attachment are, like the fruit juice in Professor Berns’s experiment.” Anyone who could say that is not really paying attention. Even the quickest look at literature and human history suggests that “unpredictability” in love is punished with rejection far more often than it is rewarded with redoubled affection. But Friedman compounds the error, suggesting that the brain circuitry at work explains not only the love of people to unfaithful partners but also King Lear’s behavior. But you cannot get from A to 8—human biology did so little to create King Lear that Shakespeare had to invent him. The use of neuroscience to “explain” fictional characters is becoming its own genre—despite the absurdity of the premise. It’s less absurd—but still crazy—when applied to actual human beings. If we assume the results of Professor Berns’s experiment are consistent across brains (and what’s the point of reporting the experiment if they’re not), then we all have more or less the same reward system in the brain—and yet love in profoundly different ways. Shakespeare, Whitman, and Rumi all wrote about radically different kinds of love—and they are all recognizably human. We love different people in different ways for different reasons, and the infinite variety of love that emerges out of the same basic brains suggests that the brain circuitry is not the key to understanding love at all. The lighting up of a reward center in the brain certainly does something, but it explains very little. We’re better off sticking to Shakespeare.